Digital media and connected devices may be all the rage, but even the snazziest of retail initiatives will fall flat if they’re not backed by human interactions and customer service. That’s why one of the best things you can do for your business in 2019 and beyond is to invest in your workforce. Study after study has shown that today’s consumers — even the young and tech-savvy millennials — crave human interactions when dealing with brands. According to PwC, customers will pay up to 16% more for a better customer experience and 75% want more human interaction. Not only that, but consumers won’t hesitate to turn their backs on a brand whose employees provide abysmal customer service. Millennials are even less forgiving. 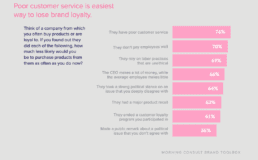 Research from Morning Consult found that “Poor customer service is the easiest way to lose brand loyalty” among Gen Y consumers. The study found 74% of millennials would be less likely to purchase from a brand they’re loyal to if customer service wasn’t up to snuff. Make no mistake: the human beings in your stores will continue to play a critical role in driving traffic, loyalty, and sales. But you need to enable them with the right technologies, so can they wow your customers and provide amazing retail experiences. While hi-tech commerce experiences will continue gaining steam, they won’t go far without the help of real people. See to it that you have friendly and capable human beings to facilitate your digital initiatives. Consider the case of The Container Store. The retailer teamed up with MJD to launch The Organization Studio, an interactive design tool and digital experience that helps customers organize their space. Here’s how it works: Customers would upload a photo or video of their organizational challenge (e.g., a messy room or closet) into The Organization Studio. After that, they schedule an in-store appointment with a live Organization Expert, so they can see the products and consult with a real person. The Organization Expert’s role is to come up with a personalized organization solution for the shopper free of charge and with no purchase commitment. What’s interesting about this initiative is that it originally didn’t involve live Organization Experts. We initially envisioned customers taking photos, videos and measurements of their organization challenge, then uploading them to an app or website. Then, a machine learning algorithm would create a digital solution board filled with products that would solve the problem. It was a solid concept, but we felt that it had something missing: the human element. So, we introduced the Organization Expert into the equation and got positive feedback in user testing. The warmth of the human interaction along with the relationship between the customer and expert were key to the digital experience. The takeaway: Physical retail environments perform far better when digital tools enhance — not replace – human interactions. Keep this in mind the next time you’re designing a new program or app. Having real people supporting your digital initiatives will not only enrich the experience, it will also drive better results. If your technology efforts are plagued by poor adoption rates and inefficiencies, consider focusing less on tech and more on the people operating them: your employees. Turns out, your staff — especially those on the front lines — can have valuable input about your tech. And if you listen to them, the results might astound you. Just ask Best Buy. As part of its efforts to turn the business around, the company conducted “hundreds and hundreds” of one-on-one interviews with its staff about usability problems around technology and applications. According to Retail Dive, those interviews helped identify employee pain points and influenced Best Buy’s move to redesign its systems and introduce new technologies in its stores. 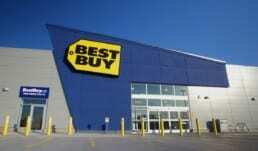 One of the key results of the effort was Best Buy cutting its POS transaction time in half. Speaking at a conference, Timothy Embretson, the director at user experience at Best Buy, explained that the move improved both store efficiency and the customer experience. The move allowed “associates to spend less time typing on keyboards or holding tablets, and reinvest that time to connect with the customer experiences so that we don’t end up cutting labor or anything like that,” he said. Have you thought about how valuable tech can be when it comes to educating your associates? New and emerging technologies are making their way into retail training programs, and forward-thinking retailers are taking advantage of the opportunity. Take Walmart, which is now using virtual reality headsets to train its employees. The company tested the technology in 2017 at Walmart Academies, then decided to roll out the initiative to all its locations in the US by sending its stores Oculus VR headsets. And while the outcomes of the wider roll-out haven’t been released, the retailer says that its tests at Walmart Academies delivered promising results. “When you watch a module through the headset, your brain feels like you actually experienced a situation. We’ve also seen that VR training boosts confidence and retention while improving test scores 10 to 15 percent – even those associates who simply watched others experience the training saw the same retention boosts,” said Andy Trainor, Walmart’s senior director of Walmart U.S. Academies. Now, does this mean you should start outfitting your team with VR headsets? Maybe, maybe not. The only way to figure it out is to evaluate your practices and identify outdated processes or steps. Then, test different technologies and see what yields the best results. Technology and your employees can certainly be a match made in retail heaven, but it takes work to make it to that level. You need to need to gather the right data, take risks, and test various initiatives to determine how to best use tech in your retail stores. And here’s the good news: you don’t have to do it alone. While retail giants such as Walmart or Best Buy can certainly take on large technology challenges, many retailers would benefit more by teaming up with a digital innovation agency. The right partner can assist you in bringing your tech visions to life — whether it’s through ideation, testing, design, implementation or all of the above. Looking for a team who can help with technology and digital innovation? Get in touch with MJD Interactive. We’d love to hear from you!